How can I stay up to date on new capabilities in DayBack? 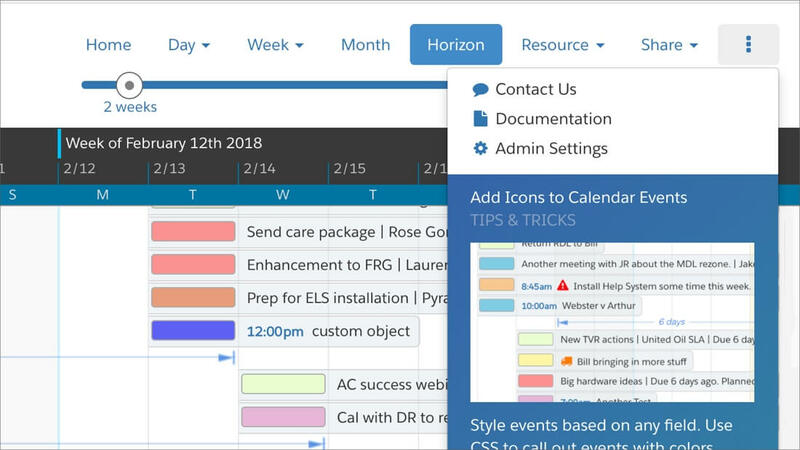 DayBack will let you know about new features, updates, and scheduling tips in the "more" menu at the top-right of the app: where the three dots are. You'll see a green envelope instead of three dots when there is new content you haven't seen yet. Yes. You have a few options here. Note that things like "admin settings" are only available to DayBack Administrators anyway, so don't turn it off just for that. You can also decide to only show these update notifications to administrators--and that's what we'd recommend as they'll often want to see what's possible in new versions of DayBack. You can decide who gets to see these "What's New" notifications in the admin settings section of DayBack: if you're an admin, click "Administrator Settings" in the Settings tab of the calendar's left-hand sidebar. Then find the "Misc" section, again in the left-hand sidebar. Within "Misc" you'll see an option to show "What's New" to Everyone, just to administrators, or to turn it off. Note that you can turn off the whole three-dots menu in the "Views" section of "Administrator Settings": simply add the word "Notifications" to the "Hide Menu Items" setting.